Here in America, fennel is not something one frequently finds in the average refrigerator. Perhaps you have seen it in the produce section with its long, fern-like fronds and its fat, white bulb. Many know it resembles anise in taste, with its mild licorice flavor. There are many culinary possibilities with this vegetable, or more properly, "herb." To begin with, you can eat fennel raw. 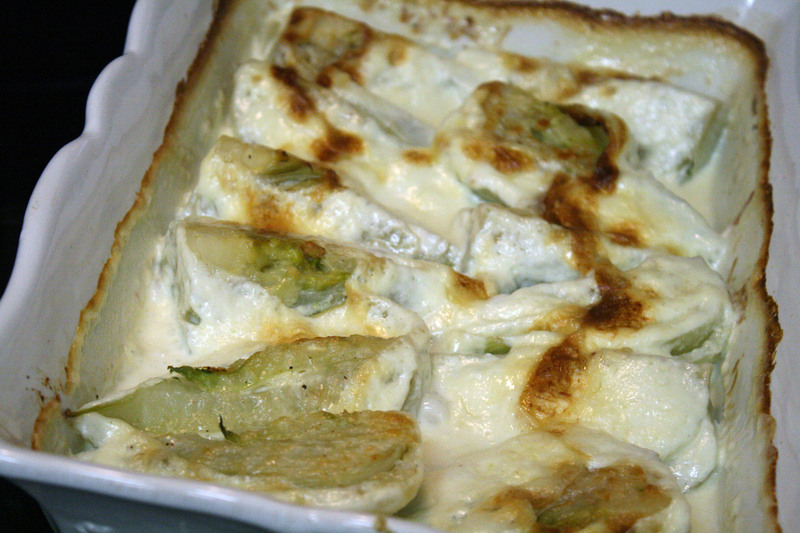 Try it as an addition to your next vegetable tray, or as the main ingredient of a salad. Fennel also makes a wonderful addition to soup or stews. Recipes seem to abound pairing fennel with fish, the mild anise flavor melding well with a delicate fish. You can eat fennel cut in wedges, steamed and topped with butter, or perhaps roasted in the oven, drizzled with a little olive oil and sprinkled with salt and pepper. And I highly recommend the Spicy Spaghetti with Fennel and Herbs mentioned in our January Magazine Review. 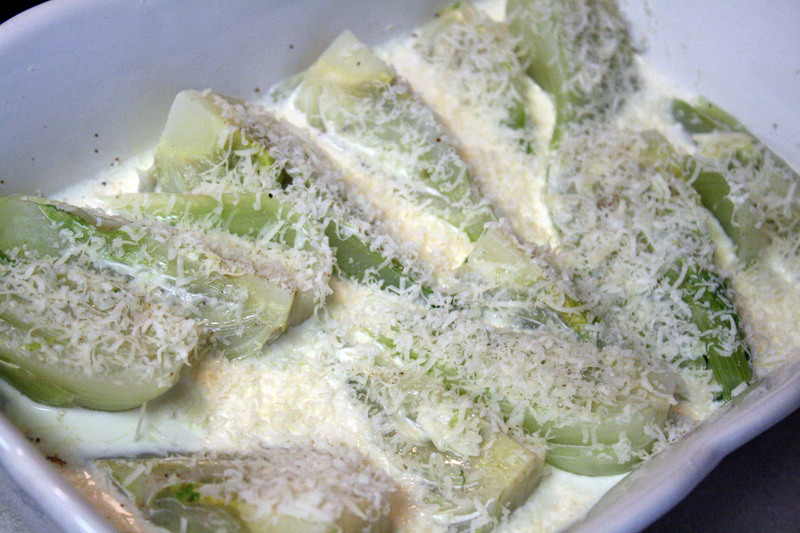 Today I have a recipe for fennel gratin which is just amazing. I served this to our guests on Christmas day. They were unsure what to expect at first but were soon raving about the dish. If you are concerned about the high fat content of the recipe, I would suggest pairing it with an otherwise low-fat meal such as fish or chicken. Preheat the oven to 400F. Put a pan of salted water on to boil. Trim the fennel tops, then cut into wedges. Boil (or steam) wedges for 5-6 minutes, then drain well. Arrange wedges in an ovenproof dish, season and sprinkle with nutmeg. Stir the garlic into the cream and pour over the fennel. Top with the parmesan cheese. Bake for 20 minutes (or more) until golden and bubbling. If you are interested in reading more about fennel, why not check out Five Ways to Eat Fresh Fennel by our friends over at Food & Think. My favorite way to eat raw fennel (bulb) is to slice it very thinly and serve it on a platter with alternated blood orange slices. Some of the fronds chopped make a nice spread over the top. The stems I save to flavor stock. I have never cooked fennel before but tried this tonight. Everyone loved it. Thanks for new ideas to my table. Mm, you can't get fennel in Uganda but I did get some seeds sent over and tried growing it in my small veggie patch a while back. I got some nice bulbs (small from lack of sunlight unfortunately but still cookable) and sliced them up for a stir-fry. I added green beans, coconut and cashew nuts and served it up with noodles. Delicious! Fennel is truly versatile and this dish looks not only absolutely yummy but also incredibly delicious!